You are a professional wedding planner. You may also plan other events of any sort for consumers. This is your contract with the happy couple. This contract can be negotiated or fixed. 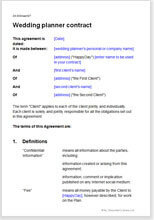 That is, you can present it and ask your clients to sign as it is, or you can allow negotiation of terms. This is not just a legal document. It includes provisions for setting up all practical aspects of the deal. These can be edited easily, or deleted, to suit you exact requirement. This contract covers what you will do in round terms, when and how you will be paid, and what you expect from your clients. The procedure for appointing suppliers is covered precisely so that you cannot be liable either to pay a third party or to accept liability if any should fail. The law in this contract is largely common law that deals with the basics of contracts: offer, acceptance, price and payment, duties, returns, dispute resolution, liabilities and risk. Extensive helpful and informative drafting notes.